The UK’s main weather forecasting agency, the UK Met Office, has forecast an above average Atlantic tropical storm and hurricane season for 2016, with the most likely outcome being 14 named tropical storms and 8 hurricanes. 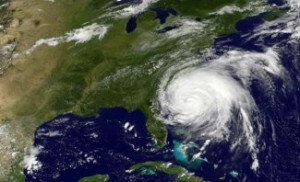 The UK weather forecasting agency joins other forecasters who have called for near to above average 2016 hurricane activity, raising the prospects of the 2016 season being more of a threat to insurance, reinsurance and insurance-linked securities (ILS) or catastrophe bond interests. With conditions said to be favorable for La Niña to develop within the next six months, the Atlantic sea surface temperatures warmer than usual in some key zones for hurricane development close to the United States and the forecasts converging on an above average forecast for 13 named storms, 7 hurricanes and 3 major hurricanes, this 2016 season is definitely one to watch for insurance, reinsurance and ILS markets. The UK Met Office forecasts that the most likely number of named storms, with winds above 39 mph, during the 2016 Atlantic storm season is 14, adding that there is a 70% chance that the number will be between 10 and 18 named storms. This is above the 1980-2010 long-term average of 12 named storms. For hurricanes, where winds reach at least 74 mph, the UK Met Office predicts the Atlantic will see 8 in the 2016 hurricane season, and that there is a 70% chance that the final number seen will be between 6 and 10. Again, this is above the 1980-2010 long-term average of 6 hurricanes per season. The UK Met Office forecasts that accumulated cyclone energy for the 2016 hurricane season will reach an ACE index of 125, with a 70% chance that the index will be in the range 77 to 173. The 1980-2010 long-term average is 104. The UK Met Office forecast does not include the out of season hurricane Alex, that unseasonably formed in the Atlantic in January 2016. 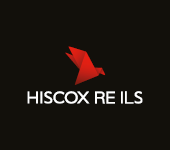 So the need for insurance, reinsurance and ILS interests to remain alert as the 2016 hurricane season approaches is clear, with forecasts pointing towards perhaps the biggest seasonal threat for some years. However, it should be noted that forecasts of hurricane activity are no guarantee of losses for insurance and reinsurance interests. It takes just one major storm to track across the U.S. coastline, in the right location of course, and the industry could face major losses, including to catastrophe bond investors. Adding this 2016 hurricane season forecast from the UK Met Office to the others we list on our dedicated 2016 hurricane season page gives us a new average prediction for 13 named storms to form, with 7 becoming hurricanes and 3 becoming major hurricanes of category 3 or greater strength. Keep abreast of the forecasts and the 2016 hurricane season as it develops with our 2016 Atlantic hurricane page. – La Niña watch, 50% chance of U.S. hurricane strike in 2016: Forecasters. 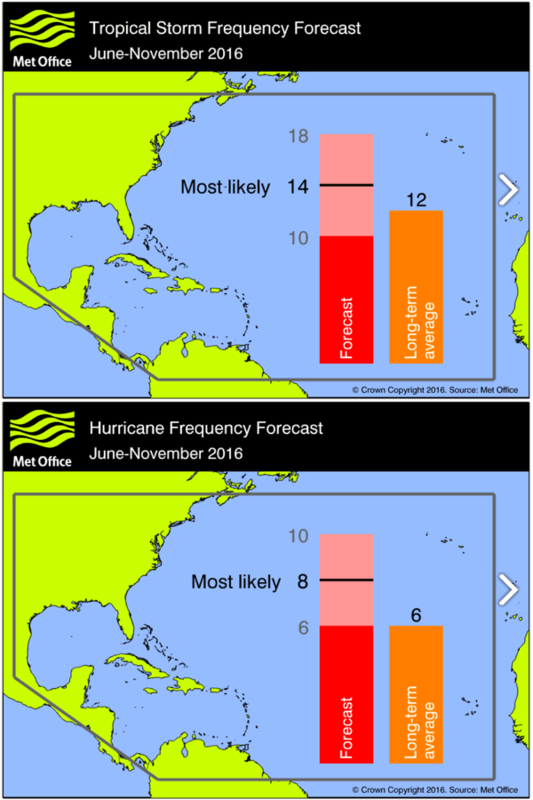 – 2016 hurricane forecasts, La Niña & SST’s suggest more active season.